Festivals evoke the memories of delicious days of childhood. We have vivid memories of Diwali being celebrated with elan. Weeks before the frenzied cleaning would leave us all exhausted. A cup of tea with some goodies would seem such an elixir. Every cupboard, every drawer, every room, and every corner would be cleaned and arranged. A lot of things hoarded and not used would go out making home lighter and better, fresh and light. Our dad would insist on making sweets at home and trying out new recipes. We would all come out with our recipes decided way in advance. There was so much happiness, laughter, excitement, merriment, and revelry. Such beautiful memories are etched in the memory. 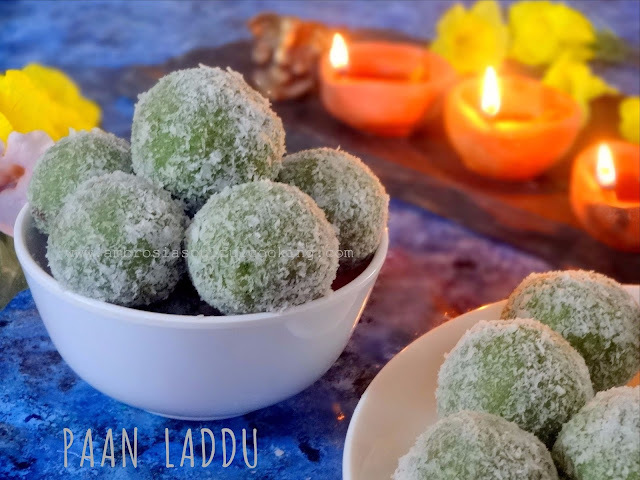 Following the tradition of making sweets at home, we made Paan Laddu this Diwali. Paan or betel leaf has immense health benefits. It is loaded with antioxidants. It is carminative, good for digestion and a great cure for stomach related problems. Paan also improves metabolism. It is a mouth freshener and is good for oral health. 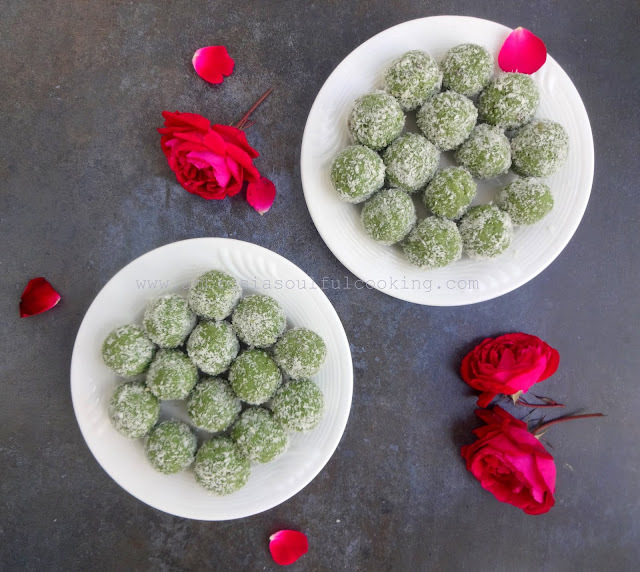 Paan laddu is not very rich or loaded with calories and is ideal to make on festivities. Recipe adapted from here. It tastes like meetha paan. We loved Paan Laddu. Put them in a grinder/food processor. Add half cup condensed milk. Blend to get a fine paste. In a steel wok, take ghee. Add desiccated coconut. Stir till coconut becomes slightly roasted but does not change colour. Turn off the heat. Add betel leaf paste. Mix well. Add remaining condensed milk. Cook on low heat till the mixture thickens and begins to leave the sides of the wok. Turn off the heat. When the mixture is warm enough to handle, take a small portion, flatten on your palm, add ½ teaspoon gulkand and bring the edges together and shape into a laddu. 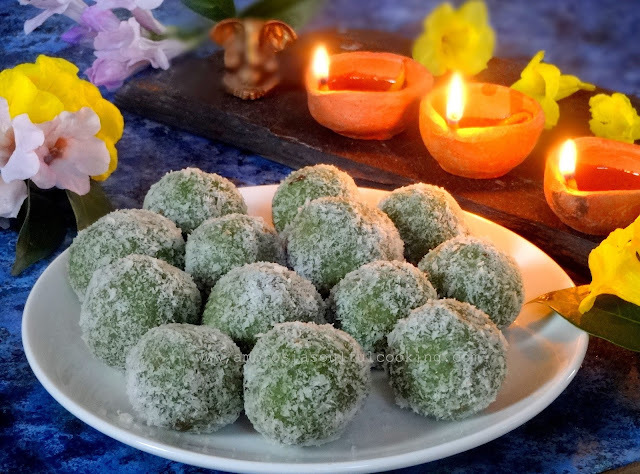 Roll the laddu in desiccated coconut. Prepare laddus with all the mixture in the same way and store in an airtight container.